What is the benefit of buying a Trust Deed from this website? access to trust deed 24/7. documents are in plain English and easy to understand. your fund auditor will have confidence that the fund rules are complying and are up to date. Can I call my SMSF anything I like? Yes-You can provide any name to your SMSF. However, most SMSFs have the family name as the name of the SMSF. For example, If your name is Bob Brown, you could probably name your SMSF the Brown Super Fund or something. Do I require an ABN for my SMSF? an SMSF is required to get an ABN registration in order to be an ATO regulated superannuation fund. Can a member of a fund be a non resident? Yes-a member of an SMSF can be a non-resident. But care should be taken to ensure that the fund remains a “resident regulated superannuation fund’’ to avoid serious tax consequences. Similarly, accepting contributions from a non-resident member can cause an SMSF to become a non-complying superannuation fund and get taxed at a higher rate. What are the basic conditions that must be fulfilled to meet the definition of a SMSF? No trustee can receive payment from the fund for their services as trustee. Who can be a member of a SMSF? Subject to a few limitations, most natural persons (which rules out companies and trusts) can become members. However, all members of the fund must be trustees of the fund (or directors of a corporate trustee) and all trustees must be members of the fund. The only exception is a single member SMSF. Please view the question of trustee disqualification for more information. have been convicted of an offence involving dishonesty under a Commonwealth, State, Territory or foreign law. have received a civil penalty order under the Superannuation Industry (Supervision) Act 1993 (SIS Act) . have been disqualified by the regulator, for example the Australian Tax Office (ATO). a responsible officer of the company is a disqualified person (a responsible officer includes a director, secretary or executive officer). a receiver, official manager, administrator or provisional liquidator has been appointed to the company. action to wind up the company has commenced. Can a minor be a member of a SMSF? Yes- a minor (person under 18 years) can be a member of a SMSF. However the member’s legal personal representative or the member’s parent or legal guardian must be a trustee or a director of corporate trustee in place of the member. Can a single member create a SMSF? one of only 2 directors and the other director must not be an employer of the member. the member is one of only 2 trustees, and the other trustee must not be an employer of the member. Does the Trust Deed allow all types of investments & choices? Any life insurance policies, for its members. Can all types of pensions be paid under the SMSF Trust Deed? What new measures are included in the SMSF Trust Deed? Removal of cashing restrictions for individuals over age 65 and not working. 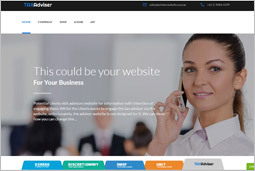 Is the website secure and will the details be provided to any marketing company? 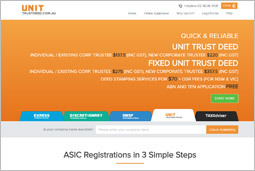 Why should you keep your SMSFTrust Deed up to date? It is wrong to assume that Superannuation law regulates how a superannuation fund must operate, this role is of the Governing Rules of the fund which prescribes superannuation law to the fund.There are many areas of law such as the SIS Act, SIS Regulations, ATO decisions, Case law & common strategies which change after fund establishment and warrant the trust deed of the fund to be updated. SMSF Trust Deeds should be up to date to ensure trustees have powers to benefit from all legislative changes. It is a myth that deeming clause in a deed which proclaims any change in law is automatically to be included in the deed,is sufficient, trustees must note that any relevant power or authority of the trustee must be conferred to them by its governing rules. To be sure that the fund governing rules have all the necessary powers to administer the fund and to assure auditors that all actions taken by the trustee are supported by the funds trust deed, trustees must ensure that their fund's trust deed is always compliant with current legislation to avoid any administrative penalties. 4 Covenants to be in included 45 Tidying up Section 52B covenants to include role of LPR once appointed as a trustee of the fund(duplicates) of the deed can be stamped for $20 each. 6 Creation of un-allocated contribution reserve accoun 74 & 75 As a result of withdrawal of ATO ID 2012/16 and introduction of ATO ID 2013/22 and the new NA T form to alert any contributions which were allocated to members in Y ear 2. 7 Non- deductibility of some insurance policies 66 Restriction by SIS Regulation 4.07D on commencing an insurance policy which other than those that are consistent with the conditions of release. 9 Administrative Penalties to be paid by Trustees personally 95 The Trustees must follow education or rectification directions from the regulator and be personally responsible for any administrative penalties. 12 Commutation of pensions up to unrestricted non-preserved component 131 This addition is for those funds which have members in transition to retirement phase and paying a pension between the preservation age (age 56 for 2015-16 year) to age 60 where the commutation lump sum can be elected to be paid as pension and is not taxable to the members up to the low –rate threshold. 13 New release authority – two years - for terminal illness 138 Trustee may allow members with terminal medical condition to access their benefits if the member is likely to die within 24 months of the date of medical certificate. 17 Ability to claim ECPI if minimum pension standards are not met 181 This is to allow claiming ECPI under certain conditions when minimum pension is not withdrawn – such as withdrawn less than 1/12 of the minimum amount etc. 19 BDBN for Pensioners 188, 190 & 200 Those pensioners who have tax dependants and drawing a pension with no reversionary beneficiaries are now able to have non-lapsing binding death benefit nominations. 20 Nomination of new reversionary beneficiary to an existing pension 175 Pensions which commenced prior to 1st Jan 2015 get special social security privileges,however if certain terms of the pension are changed, such as changing reversionary beneficiary would result in commutation of these old pensions. However now Trustees can allow a member to nominate a new reversionary beneficiary without commuting the old pension. 24 Avoidance of NALI when LRBA borrowing from a related party is at more favourable terms 116 The trustee must not borrow from a related party on terms which are more favourable then than market conditions to acquire an asset under LRBA – this will avoid any income from those assets to be taken as special income of the fund– NALI. Does our Trust Deed complies with the New GS 009? In September 2015 the Auditing and Assurance Standards Board updated Guidance Statement GS 009 on Auditing Self Managed Superannuation Fund. Paragraph 65 refers SMSF auditors to a list of consideration in examining the SMSF' governing rules and suggests procedures that should be reviewed and adapted for the specific circumstances and audit risks associated with each SMSF audit engagement. Below is the list with how our trust deed complies with the Appendix 3 of new GS 009 which should satisfy your SMSF auditor . The below information may be provided to your SMSF auditor , so that he can refer to the correct paragraph of this trust deed. Questions to be addressed in examining the trust deed. - Signed by all the members who are individual trustees? - Stamped (if required)? Auditor to check if the deed is executed / witnessed and stamped if required. Has the deed amendment been properly executed? or other party involved in the amendment? Is the amendment signed off by the current trustees? C.6 Is membership open to anyone else? Clause 14 and as long as the conditions under 17A are not breached. C.7 Do the members of the SMSF meet the definitions? - No member of the SMSF is an employee of another member , unless related. - No trustee receives remuneration for their services to the SMSF in their capacity as trustee. - Employer contributions, including contributions made pursuant to a salary sacrifice agreement? - Member contributions for which a tax deduction is claimed? - Member contributions for which no tax deduction is claimed? - Contributions in respect of minors? - Rollovers and transfers in? - Contribution splitting to a spouse? - Contributions by members who are under 65 and not working? - Contributions by members who are working part-time and are over 65 and under 75? - Mandated contributions to be accepted at any age? - Account Based P ensions? - T erm allocated or Market Linked or growth pensions? Yes, but within prescribed guidelines. 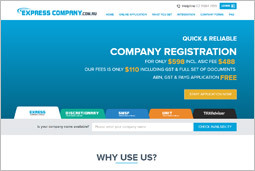 The name must not be identical to a company already registered or a registered business name. There are also restrictions on certain words. If the company is to act as trustee of a SMSF, it may be named similar to the SMSF. (For example , if the SMSF is the Brown Retirement Fund then the company may be named the Brown Super Pty Ltd or Brown Retirement Pty Ltd or along similar lines). More information about rules regarding a company name can be found here Choose a company name. Can I form a corporate trustee of a SMSF with one member? 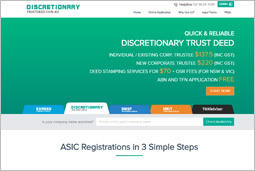 If you have got your proposed company name already reserved with ASIC you will need to submit the reservation letter received from ASIC and an authorisation letter. Hence, your company will not be automatically lodged directly with ASIC. For reserved names, after submitting the application please fax these two documents to our office at 02 9684 4199 or, our support centre will get in touch with you and guide you further. Your application may be rejected by ASIC for a number of reasons like proposed company name not conforming to the guidelines laid down by ASIC, incorrect holding company's ACN or for any other reason. If your application is rejected, you will receive an email from our system detailing the reason of rejection. You can login to our website using your password and fix the application and re-lodge it. If you have any difficulty, please do not hesitate to contact our support centre on 02 9684 4199. How can I create a ‘Special Purpose' Company with you? A company created on this website is a ‘Special Purpose’ company which can only act as trustee of a Self Managed Super Fund (SMSF). Constitution of this special purpose company will have the relevant clauses to specifically state that it is a special purpose company which acts solely as trustee of an SMSF. Can I register a company and an SMSF after office hours, on weekends or public holidays? Certainly you can. We have direct connectivity with ASIC server which means you can form your company or SMSF 24/7. Form 205A: For correcting incorrect company name. There is an ASIC fee to lodge this form. So you need to be very careful while filling the form. Even if you make a typing mistake, it would cost you to fix it. Form 492: For correcting personal details like date of birth of officeholders. If you make a mistake while setting up a SMSF, just give us a call on 02-9684 4199 or login to our chat. We will guide you further. You can apply for ABN for free on www.abr.gov.au. However the government online form takes about half hour to fill as you have to fill in several pages. We can pre-fill this form for free. You can lodge your ABN & TFN application with your Self-Managed Superannuation Fund information and some additional information which you have to provide on our form. We will notify you when your ABN is registered and is ready to use. What type of Self-Managed Superannuation Fund can apply for ABN on your online form? You can apply for ABN & TFN registration for your Self-Managed Superannuation Fund if it is an Australian resident Accumulation Fund for tax purposes and is incorporated for profit and it does not operate an agricultural business or owned or controlled by a state or local government. Does my Self-Managed Superannuation Fund need an ABN? If an identity of any fund member cannot be verified or more information is needed by Australian business registrar (ABR) then it is possible that instead of an ABN you get a reference number by ABR, in all other cases, you will get an ABN instantly. ABR will contact you within 20 days and request further information from you. Can ABR refuse to issue an ABN to my Self-Managed Superannuation Fund? Can I apply for ABN directly with ABR?